The recovery in the housing market continues to pick up steam, as home prices posted the biggest percentage gain in more than two years in the latest reading of the closely followed S&P/Case-Shiller index. The housing market is showing improvement in Western North Carolina and around the country. The index showed prices up 4.3% in October compared to a year earlier. That's the best improvement since May 2010. But that earlier increase was due to a temporary spike caused by a homebuyers' tax credit of up to $8,000 on homes purchased in late 2009 and early 2010. This latest rise comes as the housing market has shown numerous other signs of recovery in recent months. A combination of near record-low mortgage rates, lower unemployment and a drop in foreclosures to a five-year low means there are more buyers interested in purchasing fewer available homes. That in turn has lifted prices. October marked the fifth straight month that the index has been up on a year-over-year basis. The improvement in housing market fundamentals has helped to lift the pace of both home sales and home building. But even with the latest rise in prices, the index is still down 29% from the peak reached in June 2006. The bounce back in prices likely will be another positive for both purchases and construction in the year ahead. Higher prices give current homeowners a better chance to sell their home and get the down payment they need on their next home purchase. They also encourage buyers who may have been on the sidelines because of uncertainty about home prices' direction that now is the time to buy. Of course, home builders will benefit from higher prices and increased demand. Major home builders such as PulteGroup (PHA), Lennar (LEN), KB Home (KBH), D.R. Horton, Inc. (DHI) and Toll Brothers (TOL) have all enjoyed better than a 50% rise in their stock price over the last 12 months, with PulteGroup's stock nearly tripling in value. The increases in volume of home values were widespread in this latest reading, with only two of the 20 cities tracked by index showing modest price declines from a year earlier. Prices were down a little more than 1% in Chicago and New York. The greatest rise was in Phoenix, one of the cities hardest hit when the housing bubble burst. 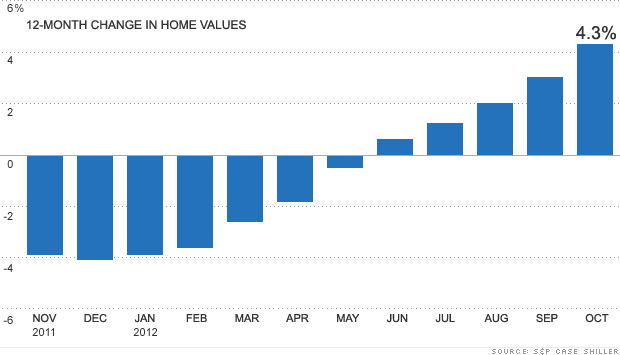 Prices in Phoenix were 21.7% higher than in October 2011. The housing market is looking up so if you are looking to sell or purchase a home or investment property 2013 is the year! Jay & Jewell Kaiser are extremely passionate about real estate. We make it our daily goal to strive to be the very best real estate professionals in the Brevard, and Western North Carolina area. This requires us to be the most informed professionals in our market area... In today's market, it is so very critical to stay abreast of new technology tools, changing laws and industry rules.